Here’s a tip from the F. A. Hobson Landscaping expert horticulturists: Although fertilizers work best when water is available in soil, it’s important to avoid fertilizing right before a heavy rainfall. Time each fertilizer application so the nutrients will move into the soil, where they are accessible to plant roots, rather than be carried off the lawn or garden by excess water. If fertilizer is carried away in water runoff instead of sinking into the soil, it can contribute to pollution. Fertilizing before a heavy rain results in most of the fertilizer washing into nearby storm drains and natural waterways. Waiting until after a rainstorm to fertilize reduces that problem. You also can control fertilizer runoff by not overfertilizing and by collecting all fertilizer that falls on a hard surface, such as a sidewalk, driveway or patio. Apply fertilizer to grass when the soil is moist, but ensure the grass blades are dry. A standard lawn fertilizer with an N-P-K ratio of 20-0-10 is applied by spreading it across the lawn at a rate of 3 to 4 pounds per 1,000 square feet on a windless day when the temperature is below 90 degrees Fahrenheit. Lawns may be fertilized every four to six weeks during the growing season to supply up to 4 pounds of actual nitrogen per 1,000 square feet each year. A fertilized lawn needs to be watered to dilute the fertilizer and to work it into the soil. Watering prevents fertilizer burn on the lawn and makes the nutrients accessible to plant roots. 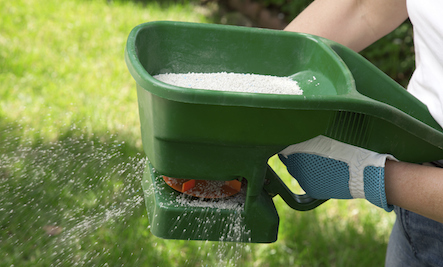 Either apply fertilizer the day before a gentle rain or lightly irrigate the lawn after giving it fertilizer. Call 410-739-6800 and let the pro’s at F. A. Hobson Landscaping answer your questions and design and build anything that you can imagine for your outdoor home. We do plantings and Japanese Gardens too!